This elaborate cartoon is Edenic in its celebration of President Ulysses S. Grant's reelection. The Angel of Peace, bathed in a brilliant heavenly light, heralds all good things to come, including "impartial suffrage" (i.e., the enforcement of voting rights for black men) and "universal education" (i.e., public schools). In the center, the names of the president and his new vice president, Henry Wilson, appear over the radiant, pristine facade of the Capitol and other federal government buildings. On the right, the symbols of peace and prosperity include a public schoolhouse, factories, ships, and a railroad. On the left side, cheering citizens include families, soldiers, and farmers with their hay wagons. 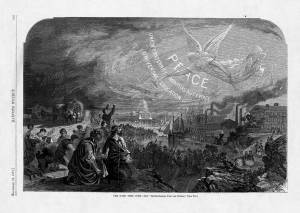 Above the latter (far left), the ominous clouds of "Anarchy," "Disloyalty," and "Ruin" dissipate in the glow of Republican victory.